The Palmetto golf course at Myrtlewood reflects a classic design, and well known by locals and tourists for it’s convenient Myrtle Beach location. Designed by Edmund B. Ault this Myrtle Beach golf course, the Palmetto Course continues to be one of the area’s favorite courses to play for over 40 years. The course is precisely located in the heart of Myrtle Beach, and close to any of the Myrtle Beach accommodations. 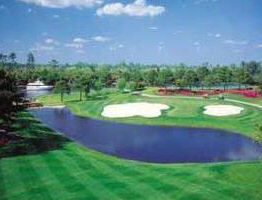 Moreover, the Palmetto Course continuously ranks as one of the Grand Strands “Top Repeat-Play” golf courses. Golfers at all skill levels agree that the Palmetto Course presents just the right amount of challenge. Combined with the course’s tranquil landscape, and designed for optimum play, the South Carolina golf course is not one to miss! This par-72 and 6,977 yardage course will force players to use precision and all their clubs. To make it to the greens, golfers come face-to-face with subtle slopes, undulations of the fairways, deep-faced sand bunkers, and soft-smooth Tifdwarf Bermuda grass greens. However, golfers experience more than just challenges at the Palmetto Course; they even experience a tranquil setting back dropped by the calm Intracoastal Waterway and just blocks from the Myrtle Beach oceanfront. Golfers…don’t minimize the challenges of this course. The approach may seem easy, and boldness may overcome your body. What many golfers see is an illusion. Play Palmetto Course with pin-point accuracy. To successfully play this course, you will need to use every club in your bag. Without a doubt, the Palmetto Course is unique. Each and every hole brings on another new challenge that is uniquely invigorating all the way to the last hole of your round of golf. The course would be nice if there were not huge sinkholes that have been there for literally years. Recently had an expericence with the club over a broken club that occurred during my visit there. The club took full responsibility and was more than gracious in helping to resolve the issue. Thank you Dustin the Head Pro for being very professional over the incident and resolving the issue with great customer service. This reaffirms why our group picked the course to play. Not only in great shape, but professional staff and the willingness to be customer focused! We will certainly return again. Course was in wonderful shape and the greens were great. Highly recommended golf course. Not a single piece of trash on the course! Great Staff. Courses in excellent shape. Well done. MW. Never disappoints. Love playing this place. $6 breakfast buffet, cant go wrong. Two 18 hole courses that are a good test of golf. I've played both courses recently and even though it's winter conditions they were both in good shape. I live locally and play most of my rounds at TPC but I play elsewhere once a week. Myrtlewood is always a fun stop. If you haven't played here in a while y io u need to, course in great shape and staff appreciates your being there . Played Pinehills. Nice layout. Good condition for winter season. Reasonably priced. Great course, make that 2 courses, staff was great and love the layout. Brutal pace of play, sub-par maintenance. Houses are lined fairly close to the fairways. No real standout or memorable holes. On the bright side, good service at the golf shop/restaurant and good midtown location. The course is very playable, was in great condition, however with all the rain, it was cart path only. The staff were very friendly. Great experience. Very good staff polite & helpful. Enjoyed the lay of the land. Ww enjoyed the course! It was challenging without beating us down... We are casual golfers. The only complaint we had was that you aren't allowed to use your own cooler, but they don't provide a cooler, either. On a sweltering August day, a cooler would have been helpful to keep our water and beer cold. Excellent course I would recommend this course to anybody who wants to enjoy a great round of golf in Myrtle Beach. It has challenges but if not unforgiving of minor mistakes. Great golf course. Only complaint was there was a slow foursome in front of us. I couldn't figure why they were taking so long especially when on the green. Found out they were getting golf lessons. I have no problem getting lessons but when you start backing up play, it gets ridiculous. When we decided to skip that hole and went around them, the instructor turned us in saying we cut in front of them. There's far too many golf courses here to have to deal with that. Lesson learned. Put this on my DNR (Do Not Return) list. The layout of the course is very nice and I would give them a great review if it wasn't for the awful greens. It was impossible to get a proper read and half of the grass on the greens were dead. Otherwise, great course. Played the Palmetto course and really enjoy the layout of the course. The fairways and tees are in good shape. Well manicured and taken care off. They pay close attention to detail on this course, however, the greens are in TERRIBLE shape. And these greens haven't even been aerated yet! Most of them are either burnt out around the edges from lack of water, disease, or a new person mowing the greens and cutting to far into the fringes! The greens that are in decent shape are bumpy and it is impossible to get a true roll. I played a great round for me today on this course (83), but I can only imagine that I would have probably broke 80 if not for the garbage greens! Cmon man, just a little bit of effort, especially when I am paying $50 for a round! By the way, the staff is very friendly in the clubhouse! The Palmetto golf course at Myrtlewood reflects a classic design, and well known by locals and tourists for it’s convenient Myrtle Beach location.